This recipe for Wild Mushroom and Brussels Sprouts Quesadillas is such a perfect one-dish healthy meal for fall! You can use any type of mushrooms in this, but we loved it with shiitake. And if you’re feeling up to it, double the recipe because the leftovers make a pretty awesome lunch. Enjoy! In a large skillet, melt the 2 tablespoons butter over medium-low heat. Add shallots and sliced sprouts to the pan and cook, stirring occasionally, until they begin to brown, 3 - 5 minutes. Add the mushrooms and spices to the pan and cook for another 3 - 5 minutes, until the sprouts are tender when pierced with a fork. In a large bowl, combine the two cheeses. Evenly divide the cheeses and filling among four of the tortillas and top with the remaining tortillas. For each quesadilla, spread a little butter on top and then flip it over into the skillet set on medium heat (use the same skillet as used for the veggies or a large griddle set on 375° F). Spread a little butter on the top before flipping to cook the other side. Cook both sides until golden brown and the cheese is melted on the inside. Serve with sour cream, lime wedges, and fresh cilantro. Will the feta cheese really make a big difference if I leave it out? Pregnant and can’t have feta! Hi. You could switch it out for another rich cheese. I bet this would be delicious with spinach in place of the sprouts, too! Thanks for the recipe. Can’t wait to try it. We love quesadillas! Almost anything goes in the filling! Thanks for the new idea of using brussel sprouts. I have never liked brussels sprouts until I had them in a blue apron recipe recently. 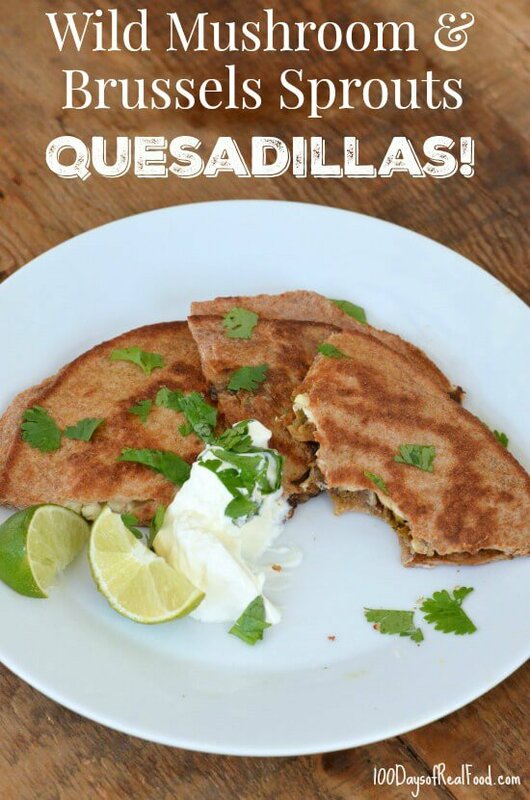 These sound really good – I love quesadillas, so filling and easy to make. 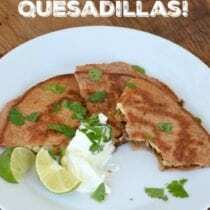 It makes me miss my George Foreman grill – I used to make quesadillas & paninis on it, so easy because it would cook from both sides so no need for flipping! That is such a great idea about the George Foreman grill! I made these last night, and they were fantastic! My husband said he would eat them everyday. Only substitution was that I don’t eat shallots (or anything in the onion family), so I left them out completely and added black beans. I’m eating the leftovers for lunch right now, and it’s just as good.